We repair and service Sunna inverters! If you’re in need of Sunna inverter repairs, or it’s time to get it serviced, you only need to make one call. Service My Solar is your one-stop shop for Sunna inverter repairs and service. We guarantee honest advice and quality workmanship so that you can get back to enjoying solar power sooner. Our recommendation is to replace the inverter. As there is no fault information, it’s hard for us to identify the nature of the issue. Therefore, we would attend, investigate and repair if possible or replace if not. These mean that the AC condition is outside the range allowable at the inverter (eg. your grid voltage). On some meters, you can actually check the voltage: use the scroll button on your power meter until, on the left hand of the screen, a “U” appears. To the right hand side, the number will be your voltage. Ideally, this should be 255 volts or lower. If this fault is permanent, you should book a health check, as the internal fuse or AC board internally may be damaged. The manual recommends moving the inverter to reduce the ambient temperature. The first thing to check is the solar supply switch usually located in your main switch board or sub-board. If it is on, it could be an issue with one of your isolators. Otherwise, like the AC faults, it could signify an internal fuse or AC board being damaged. This type of faults can be indicative of a surge as well, so, if you have had a storm or blackout, this could have been the cause. Depending on your home insurance policy, you might even be able to claim it. We can assist you in verifying this and provide a report if eligible as part of our inspection. This can mean that there is water in the top box or elsewhere in the installation. We would recommend a health check with a provision for a replacement. Sunna inverters are a complicated piece of equipment so it’s essential that they are repaired by Clean Energy Council accredited electricians. At Service My Solar, we use a thorough Sunna inverter service procedure to ensure your inverter is repaired quickly, correctly and in the most cost-effective way. Even though these were sold with a five-year warranty, there is no longer warranty support if you have this inverter installed. We recommend booking a health check. If we can repair it for this price, then you’ll be up and running. However, we will also bring with us some replacement options so that, if it isn’t repairable, you can still be up and running on the day and don’t have to pay multiple site visits. 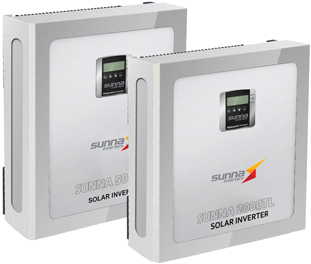 Call 1300 496 278 to talk to one of our friendly technicians about Sunna inverter repairs.